The Wolfenstein series has never really been part of my color wheel, even though I’m totally okay with the idea of Nazis being punched in the face until they go away forever. And I recently found out that it’ll (apparently) have some moral choices, as well. So that’s a bonus in my book! Even though it’s still not a game I particularly want to play I might still purchase Wolfenstein II: The New Colossus when it’s released on October 27, to make a point if nothing else. Fair warning, there be politics here. And a touch of ranting. For those of you who haven’t been keeping up with the political situation in the United States, I’m really, really jealous there are a whole lot of differing opinions being thrown around, to put it lightly, and certain white supremacy groups, including Neo-Nazis, have felt… erm… empowered as of late. 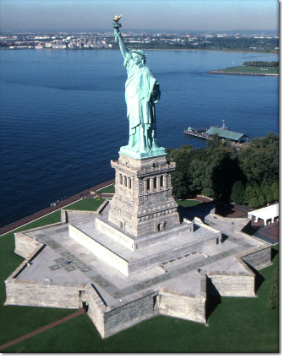 Now, the cool thing about the United States is that everyone is entitled to their opinions, beliefs, and values, as long as acting on those beliefs doesn’t impinge on the rights of another person. This is why hate groups like the Ku Klux Klan can exist and have parades and things, but it’s still very illegal for them to, you know, act on their beliefs in certain very illegal ways. However, what has been striking to me is that these groups have suddenly felt like they can act on their ideas and hurt other people, and will be called “upstanding people” and know that the President is telling the rest of the population to not be so cranky about their hate crimes. On a totally unrelated topic, Wolfenstein II is a game set in a completely alternate universe where Nazis have taken over the United States and the people who know what the United States actually stands for need to take it back. But the reason I want to purchase this game is mostly because of the backlash. Our dear Neo-Nazi friends have taken offense at the “libtard” agenda hidden in Wolfenstein II, which unfairly paints the group responsible for sticking 12 million people in an oven and turning it on Nazis as bad people. 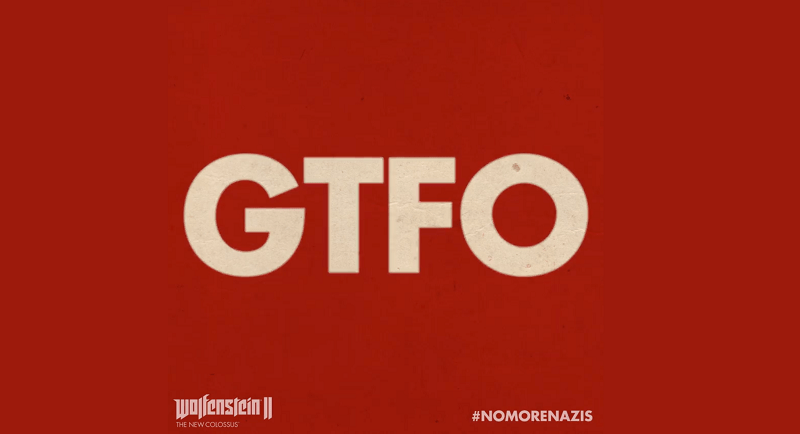 What has caused the most stir is an advertisement saying that all Nazis need to “GTFO” (that’s literally what the ad says) of the United States. Gosh darn liberals infiltrating video games with their agendas, amirite? First SJWs ruined Mass Effect: Andromeda because gay people exist, and now they’re trying to ruin this game, too? I mean, it’s not like this is the eighth game in this series or anything, or that the staple of a Wolfenstein game is killing Nazis. Which brings me back to my point. While speaking with one’s wallet does not fix all the problems, I do generally try to support things I agree with, which is why I saw Wonder Woman three times in theaters even though I rarely go to the movies anymore (well, plus it’s a really great movie). So I’ll be supporting Wolfenstein II, even if I never play it, just to help ensure that it’s a success. Just to send a not-so-subtle message. Because in my opinion, if you’re a Nazi… yeah, you can GTFO. Have you ever played a Wolfenstein game? Did you like it? Have I been missing out all these years? Will you be picking up Wolfenstein II? Has its wild political message gone too far? Let me know in the comments! It’s interesting that you mention how you try to support things you agree with because I realized that there were a few instances in which a game had a message I was totally on board with, yet I still ended up disliking. The best example is Spec Ops: The Line; when two well-known independent critics called it Game of the Year and one of the greatest games of its generation respectively, I thought there may have been something to be gained from playing it. When I actually tried it out, I realized when playing it that the only thing keeping them from declaring it one of the worst games of 2012 was its story. If it had a generic modern military shooter plot, I know they wouldn’t have been nearly as kind or as willing to overlook its serious flaws. There’s no way of saying it without sounding like I’m agreeing with the opposition, but I feel confirmation bias is a legitimate problem plaguing game journalists as of late. To backpedal slightly, I will say that it’s probably not as big of an issue as some make it out to be, but I think it has caused critics to promote games without seriously analyzing them simply because it has a message or cause they can get behind. Spec Ops: The Line was a harsh, well-deserved deconstruction of the modern military shooter, yet its bad controls and interminable loading screens made it worse than most straight examples. The Last of Us supported the “video games as art” argument, yet for all the effort Naughty Dog put into their presentation, that same attention to detail wasn’t applied to their story or the actual game. I like how Gone Home included two homosexual characters in a normal, matter-of-fact manner, yet there was too little substance to justify its initial $20 price point. The Beginner’s Guide inspires many fascinating discussions, yet it gets nothing out of being played. The opposite holds true as well; I can’t agree with the protagonists’ methods in Peace Walker, yet it remains one of my favorite games of the decade. Part of it was because it handled moral ambiguity far better than many games that followed. Therefore, if I pick up Wolfenstein II, it will be because it’s a good game; fighting Nazis will have to settle for being the icing on the cake. That’s a good point, and I’m certainly not against critiquing highly-anticipated games in favor of padding scores or making people happy, which is a bit of an issue now, it seems. As much as I disliked Spec Ops, I don’t regret buying or playing it, though, because I did like the idea of trying to question gamers’ actions during play. It was poorly done, but was a nice idea. If people were more critical, maybe devs would have produced something similar, but a little tighter, next time. Okay, yeah, I’ll support that. You don’t sound like you’re agreeing with the opposition. And I get what you’re saying. No, blindly buying games should not be common practice, and yes, my motivations for wanting to buy Wolfenstein are purely political. I’ll admit that. But if my purchase can help reaffirm that the USA and Nazism don’t mix, even if the game is terrible… well, I’m okay with that, for better or for worse. Another reason I don’t have much respect for Spec Ops is because another game managed to do what it tried to do far more successfully, rendering it obsolete in the long run. It doesn’t help that between those two games, I played Spec Ops second. I suppose I can see some merit in doing that, but at the same time, I feel one should enjoy a game because they genuinely like it more than anything else. If one is getting into a game or any other work solely because it’s in line with their worldview or purely to spite those they oppose, however odious said opposition may be, it can be unhealthy if it’s taken too far. I own Wolfenstein: The New Order but never got around to playing it. I have Wolfenstein II: The New Colossus preordered, and I will play it by the end of the year for a number of reasons. 1. As a teacher who uses video games in the classroom and talks about video games and their rhetoric, I try to play the really important titles that release whether they be controversial, subversive, set new standards, or are just really fine games. In one sense, playing video games is how I stay up-to-date and informed with both the industry and how new media impacts our lives–this is important to my career focus. 2. In recent years, I have almost always picked up Bethesda titles, played and enjoyed them. I don’t know why this game should be any different. 3. This game is so rich rhetorically that I cannot pass it up. I may end up writing an academic article about it, but it’s too soon to tell. 4. I also try to show support when I am able with my wallet. 5. I generally enjoy first-person shooters. I was watching Bethesda stream some gameplay of this title last week, and it honestly looks like a lot of fun. Even if it weren’t for that, I’d be tempted to toss them my money to help ensure its success. I do foresee this as being a game I will talk about with my students in the spring (when I teach a course focused on games and rhetoric). At the very least, the social commentary and backlash is worth discussing. I think that I used to have Wlfenstein 3D in the MS-DOS days. I kinda remember enjoying it, but finding that there were a bunch of other FPS games that I got more out of. Still, given the general premise of the series, it seems daft for people to complain like it’s a new thing now. Wolfenstein is awesome. I’m amped for the game to release. Kicking Nazis butts is always the best course of action. It is alarming that works like Wolfenstein or The Handmaid’s Tale are more relevant now than when they were created 30 years ago. The good thing here is that art remains, in case we need to be reminded of some admitedly basic truths. I haven’t played Wolfenstein, because I never got into shooters, and I will admit that up to the seeing the newer ads, the game looked like your run-of-the-mill alternative history fare (I had flashbacks to the time I watched Red Dawn). That said, I am willing to try this and the new Far Cry, if anything because they seem to have premises that attack the core of toxic gaming. Sigh. Yes, I know, right? It would be a very sad day if artists were silenced, and we’d definitely have some major issues to contend with at that point! Same here; I’m not a big FPS person, but the controversy got my attention for this one, and then it actually looks like it might be a decent game (similar to my thoughts on Far Cry 5, so it’s funny you mention that). At the very least, these games are willing to explore taboo subjects, which is something I appreciate in any art or entertainment medium. It’s funny that there is so much backlash about this Wolfesntein game and how you’ll shoot Nazis. I mean I’ve been playing the games since Wolf 3D on MS-DOS and the series has always been about shooting Nazis. This isn’t a new political approach for the series, it has literally always been a game series where you shoot Nazis. Right? I hope the folks who are mad just don’t realize what the series is about… Although I think Bethesda is starting to tap into that backlash for marketing purposes, which sort of flirts with the line of *making* it political. Like, they paraphrased Trump in one of their most recent tweets (after I posted this article). I mean, I’m okay with games getting political when telling their story, but it’s hard to say it’s all ambiguous when the marketing team starts to actually take shots like that. But you’re right that the actual *game* was not designed with a political agenda! Shooting Nazis has been a part of video game history almost as long as there’s been a video game history. It’s crossed genres, crossed generations, crossed the world. I’ve never had any particular buying decisions motivated by hurting video game Nazis, and yet I still have several games in which I smash Nazis. Nazi crushing is built into the very DNA of gaming. Other groups doing this, I could sympathize with their position. Marking an entire subset of society as a villainous race without actually understanding or even caring about where they’re coming from is a very dangerous proposition that’s led to a lot of evil in human society. Like the Nazis. Hmmm… With our modern day Nazis, it’s not like WW2 Germany was just an extremist sect, that was what the party is about, and history has already clearly judged them. It’s not like modern day Nazism has any sort of philosophy going that didn’t already lead to horrors. Aside from that, though, looking at Wolfenstein II, I just keep having flashbacks to Dante’s Inferno’s patently offensive campaign where they had fake religious fundamentalists protest their game as a marketing measure. Why can’t people just not be dumb for a while? Yes. Yes yes yes to all of this. Thank you!! Right? It’s supposed to be a good game, as well, so that’s good at least, but being against Nazis is alright in my book!